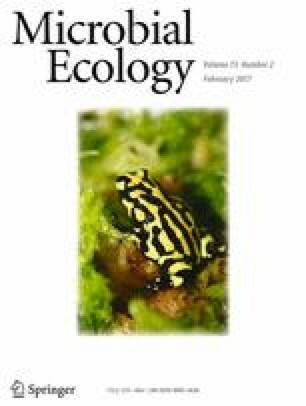 Pathogens currently threaten the existence of many amphibian species. In efforts to combat global declines, researchers have characterized the amphibian cutaneous microbiome as a resource for disease management. Characterization of microbial communities has become useful in studying the links between organismal health and the host microbiome. Hellbender salamanders (Cryptobranchus alleganiensis) provide an ideal system to explore the cutaneous microbiome as this species requires extensive conservation management across its range. In addition, the Ozark hellbender subspecies (Cryptobranchus alleganiensis bishopi) exhibits chronic wounds hypothesized to be caused by bacterial infections, whereas the eastern hellbender (Cryptobranchus alleganiensis alleganiensis) does not. We assessed the cutaneous bacterial microbiome of both subspecies at two locations in the state of Missouri, USA. Through 16S rRNA gene-based amplicon sequencing, we detected more than 1000 distinct operational taxonomic units (OTUs) in the cutaneous and environmental bacterial microbiome. Phylogenetic and abundance-based dissimilarity matrices identified differences in the bacterial communities between the two subspecies, but only the abundance-based dissimilarity matrix identified differences between wounds and healthy skin on Ozark hellbenders. The higher abundance of OTUs on Ozark wounds suggests that commensal bacteria present on the skin and environment may be opportunistically colonizing the wounds. This brief exploration of the hellbender cutaneous bacterial microbiome provides foundational support for future studies seeking to understand the hellbender cutaneous bacterial microbiome and the role of the bacterial microbiota on chronic wounds of Ozark hellbenders. The online version of this article (doi: 10.1007/s00248-016-0859-9) contains supplementary material, which is available to authorized users. We would like to thank members of the Williams lab for assistance in revising this document. Special thanks also go to Jyothi Thimmapuram from the Purdue Bioinformatics Core, Phillip San Miguel and Paul Parker from the Purdue Genomics Core for assistance in project design, Bart Kraus for assistance in field collection, and Ardith Wang for assistance in sequencing preparation. Special thanks to the Missouri Department of Conservation for their interest and support of this project. Funding for this study was provided by Purdue University.